Have you ever met Jenny? She is the genius force behind the amazing blog, Picky Palate. And… she is having a baby! A few friends got together to throw a virtual baby shower, and I was fortunate enough to be able to bring a cake! Well, did you know that sweet Jenny INVENTED the Oreo stuffed chocolate chip cookie? You’ve seen it everywhere right… that glorious creation of a chocolate chip cookie with an entire Oreo hidden in the center? Jenny was the Original! Isnt that cool? So I decided to make a cake that was as unique and as fun as she is. Which is no easy challenge! The outside I based on her adorable blog design. The border is made to mimic Jenny’s pretty scalloped blog header. The rattle is a “baby-fied” interpretation of her knife, fork, and spoon logo. 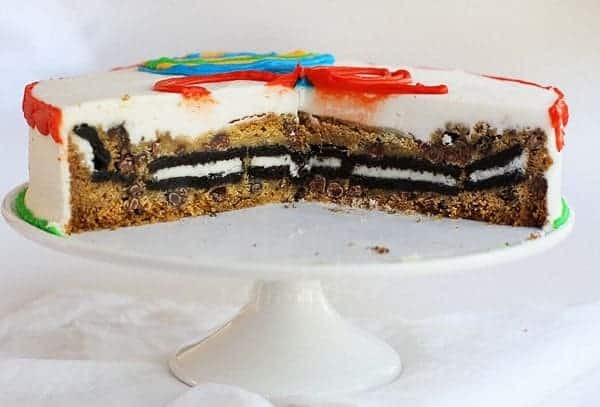 A chocolate chip cookie Oreo stuffed Cake! You totally saw that comin right? 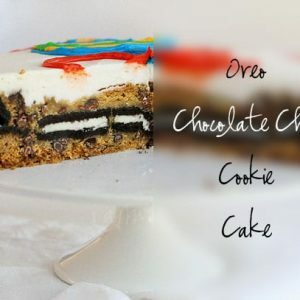 I posted a quick “recipe” for this cake below, but be sure to check out Jenny’s Original Recipe to make mouth watering Oreo Stuffed Chocolate Chip Cookies! In a well prepared 8inch cake pan, place half of your cookie dough. Press down so that it is a flat layer. Starting in the center, place Oreo's flat on top of cookie dough. Press down remaining cookie dough over Oreo layer. In an oven heated to 350, bake for 25-35 minutes. At 25 min. I placed an aluminum foil ring around the edge of the pan so the cookie edges would not burn, and then watched closely. Remove from oven when center is no longer shiny. Let cool and cover in buttercream. So many folks love Jenny and made special treats for her! I cant wait to stop by and see all of the beautiful creations! Absolutely ingenious…and delicious, for sure! That is the coolest “cake” ever!!! I love how you customized it to match Jenny’s blog header…how cute!! You always have the best cakes here!!! I am making a cowgirl boot cake. 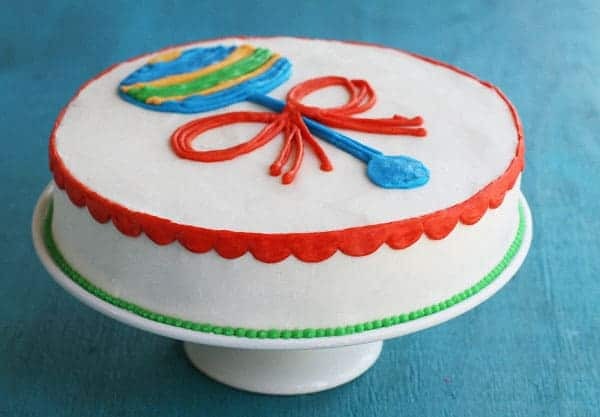 Here is my question: do you think if I make this cake in a 9×13 pan (of course the recipe will be doubled) can I easily cut out from a template into the cake?? 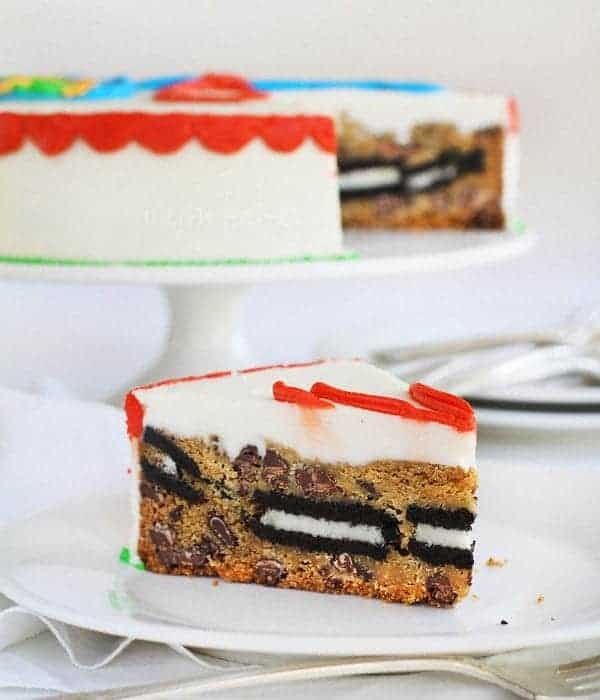 Or will the oreos and cookie layer make it hard to cut a design? Thanks for your help!! I would just cut it IMMEDIATELY out of he oven. The longer it sets the harder it would be to cut. Have fun! I hate to be the one to say it, but that is positively disgusting. Oreos belong nowhere in any baked product. How dare you call yourself a baker? By the way, any good shorbread recipe has either cornstarch or rice flour in addition to the AP flour. I am a baker. I studied the art and practice it. Hi Heidi! Thank you so much for your honest feedback. I started my blog, i am baker, as an offshoot to my original blog, i am mommy. And while I feel confident in saying “I AM MOMMY!” I am often hesitant to declare I am baker. I have questioned my choice in blog titles many times! I am not trained, I just bake things I like. I have so much respect for those folks so ARE trained, as I know how difficult it is. Kudos to you! So sorry if my blog is displeasing to you. I promise I will try to work harder at the technical side of baking. 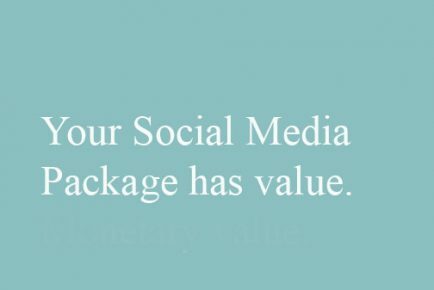 Thanks, and have a great day! I’m doing this! Looks incredibly good! Whaou ! 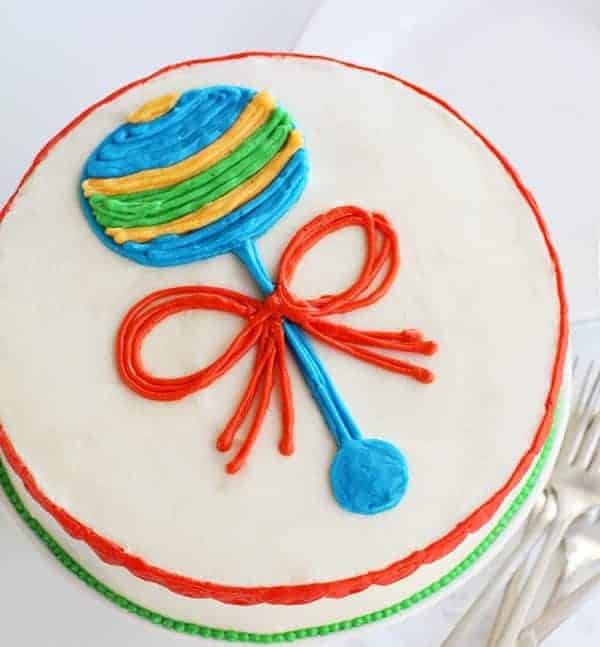 Super nice inspired cake ! You dis a great job, i’d love to taste this ! I live in Scotland. When we want to bake a cake in the UK we use things like flour, eggs and butter. In the US you buy a tub of cookie dough and throw in some biscuits. Why not just buy a cake? A cake baked ‘from scratch’ has a home baked taste and has much less addatives. I bake a fruit cake where you simmer the fruit, sugar and butter in a pan, allow to cool and then add the flour and eggs. You have to be in the kitchen for a total of less than 15 minutes. I know that you are trying to save busy people time but you end up with a ‘processed’ cake which will always be inferior to home baked cakes. What a perfect treat for Jenny! Great job, Amanda! Hi, Amanda. My family does NOT like store bought cookie dough. Do you have any idea how many batches (approx) of Toll House cookie dough I would have to make to equal the 36 oz tub? I think it would be two full recipes. Hope that helps! 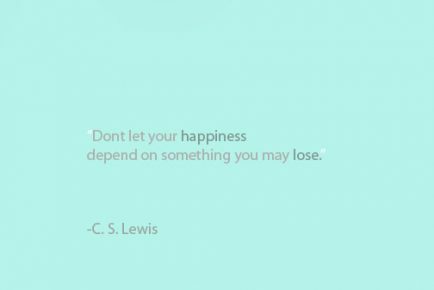 Be blessed! Oh wow this looks incredible. I need it right now!!! Hi, I came across this as a great option for my father-in-law’s birthday who loves cookies and Oreos. I won’t have much time and was wondering if you knew how well this would keep frozen so I could make it about a week in advance?